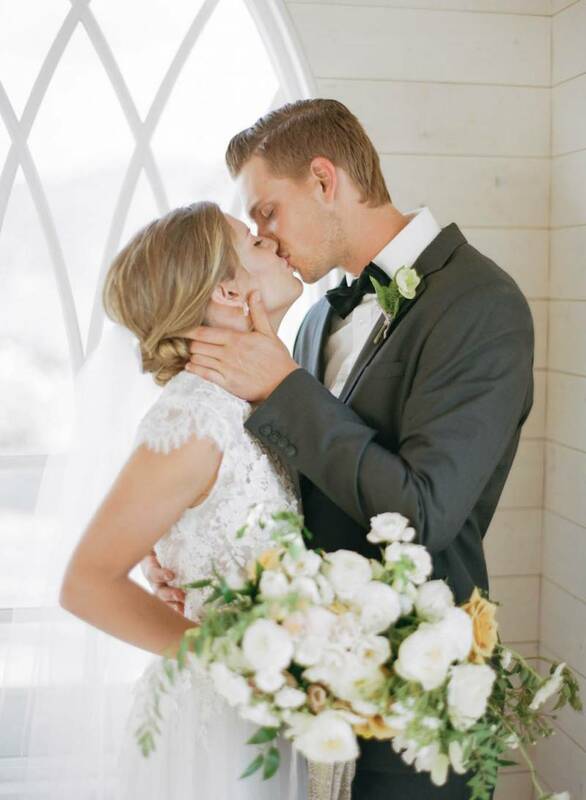 From the stylist Kaitlyn, "Walking into the Rose Room at Sanctuary Gardens, I was instantly inspired. The Okanagan is known for it's scenic views of the mountains and water (for good reason, of course), so, when I saw this new space it felt like a breath of fresh air. From the white washed wood, cathedral windows and a statement chandelier, my heart literally skipped a beat. It was clear the direction this shoot would take - ethereal and European inspired. Along with this, simplicity and intention are the words I strive for every wedding, shoot and in everyday life. Megan and Jayden, a recently engaged couple were eager to be a part of creating something beautiful. They both have a soft spot for Europe, specifically the french countryside. We wanted to curate a session around this growing theme and give them a piece of inspiration for their real wedding next summer. The starting point was the color palette. My belief is that the space you choose as a backdrop should be enhanced with design, not create competition. With that, it was all about white, grey and gold for this space. This initial piece had me so excited to share my vision and get other creative on board. I knew JENNA HILL had to be the one to capture this shoot - her fine art film approach and natural ability to capture those raw moments bring images to a whole other level. After speaking with her, everything seemed to fall into place. Melinda from A NEW LEAF FLORAL DESIGN was the perfect addition - creating free form arrangements, as if they are stretching towards the sun. She sold me when she mentioned she had ribbon from Europe - could the match have been any more perfect?" Can we also just talk about this pretty cake by SUGAR SWEET? Love the subtle touch of gold leaf. "Being close with Lisa of LILLIAN WILD BRIDAL and having knowledge of the dresses and designers she carries I already knew which one was the perfect piece. 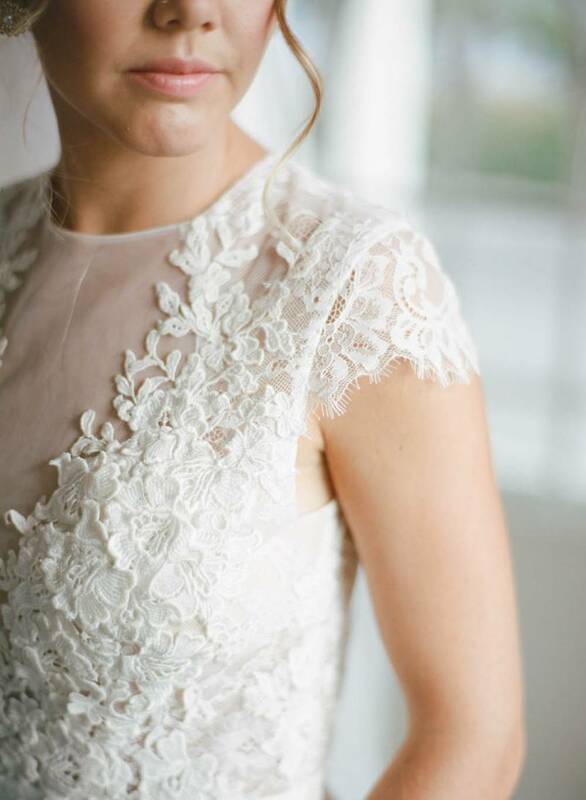 A high collar, cap sleeved, lace detailed dress with an illusion neckline, what is not to love? Along with a soft tulle skirt and paired with a lace edged cathedral length veil, and delicate jewelry, it was the epitome of classic. Keeping with simplicity, we chose a low chignon with a few soft face-framing pieces for hair styling. Makeup was inspired by the sunset - soft and warm tones. Creating the table design was definitely my favourite piece. It was all about layering and tone on tone. Natural linen from WHITE EVENT STUDIO set the tone. With details including a grey silk table runner, marbled charger plates, gold plated flatware and pews adorned with delicate greenery. The stationery provided by MAURELLE CALLIGRAPHY helped to elevate the setting - keeping with a marbled look and beautiful gold detailing. To prevent over crowding I chose to have three centerpieces and two candles - creating ambiance without clutter. The gold roses added the perfect pop. I lied; creating this cake display was also a favourite piece for me. Kirsten of SUGAR SWEET CAKE COMPANY too> took a pair of shoes as inspiration and created something absolutely magical. 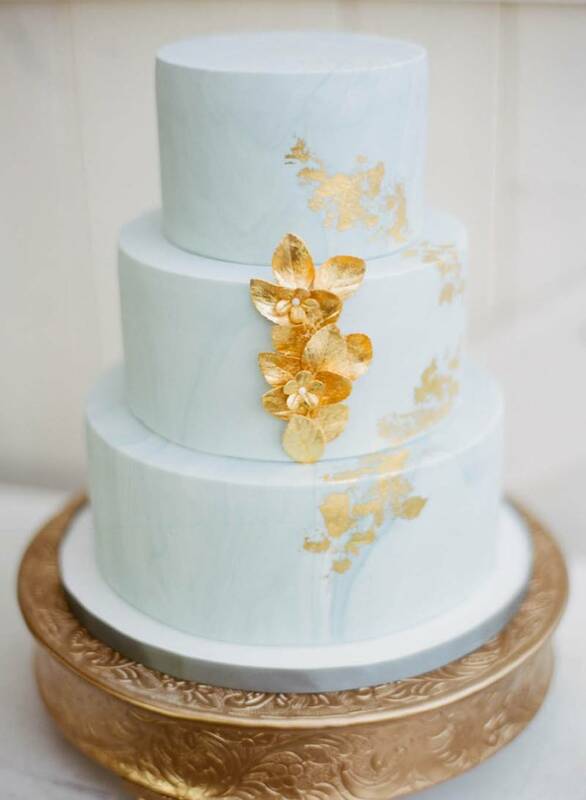 A three tiered, grey-marbled cake, accented with gold foiling a sugar flowers took center stage atop a vintage gold cake stand. Resting on a French nightstand, below a floral wreath, it was all kinds of yes."